It's the second ever Australian Open of Surfing. Some of the world's best surfers and skaters are roaming the streets and the biggest mobile skate bowl on the planet is on our beach. Meanwhile, down the road from the comp, Hotel Steyne was skater HQ, accommodating the skateboarding contingent within their sturdy red brick walls. With some of the world's best skateboarders staying in the rooms upstairs, The Steyne, along with the crew from Solid Racks, decided to install a mini ramp in the beer garden for the weeks' worth of festivities. 45 passes were given to selected pro skaters from the Manly area as well as those that have ventured here for the competition and good times. The skaters, youngest starting at 7 yrs old, are free to skate the ramp for the duration of the Australian Open of Surfing as well as enter the Mini Ramp comp presented by Xpreshon, The Hotel Steyne and Carlton Dry. 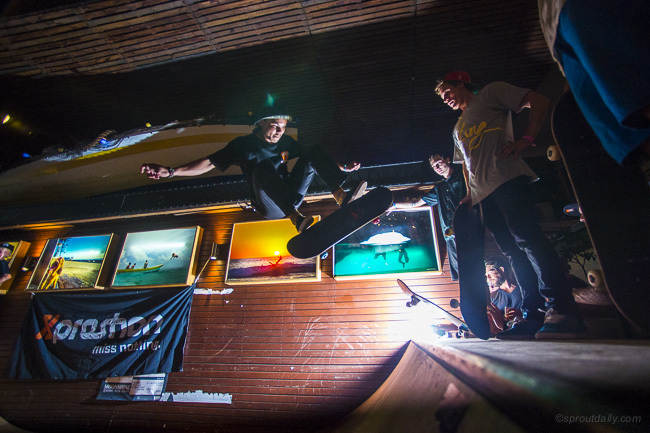 Tuesday, 11.02.14 saw the hotel's beer garden filled with spectators and incredible skating from some of the worlds best during the Xpreshon Mini Ramp Invitational. MC’d by Pete Long, the prize purse was awarded by a skaters’ choice judging panel, which added to the laid back vibe of the night. Pete’s notable standouts from 1.5 hour jam session. *Aussies -RJ Barbaro, 10 year old prodigy Keegan Palmer Jake Smyth, Ben Fawcett, Dylan Monk, James Hoy, Anthony Bull, Lewis Wood, Karl Dorman.